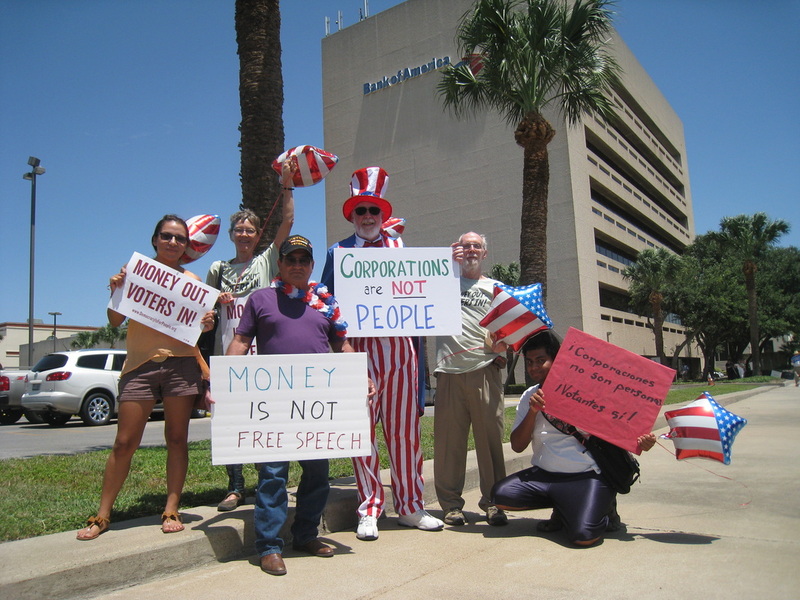 Wednesday, July 2nd, members of the Lower Rio Grande Valley group held a rally at Sen. John Cornyn’s Harlingen district office to urge him to vote YES on S J Res 19. 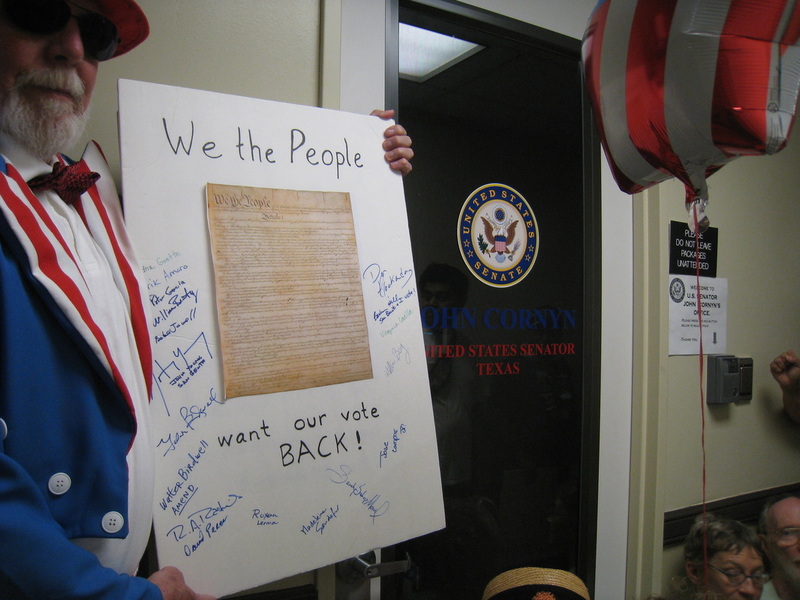 Veteran members were joined by several new enthusiastic supporters – and Uncle Sam! 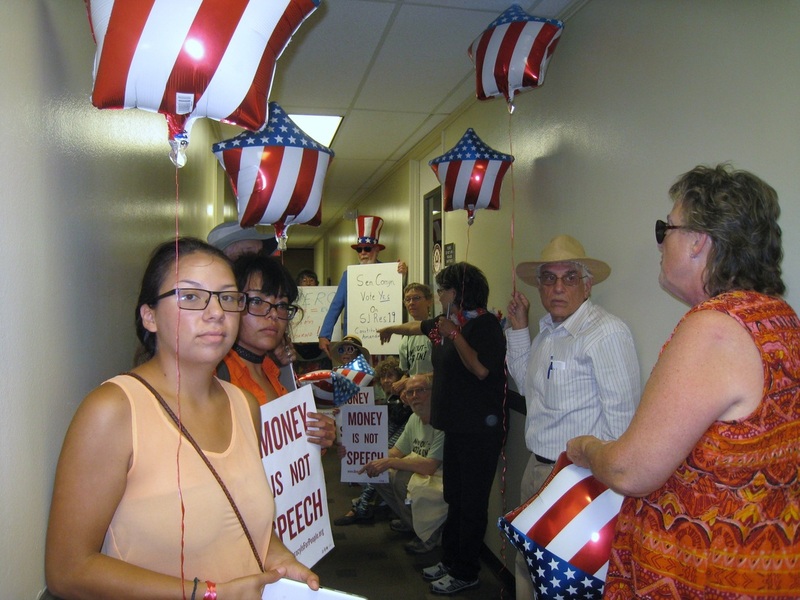 The Senator’s South Texas Regional Director and Community Outreach Advisor, Ana Garcia was given petition signatures and an enlarged US Constitution signed by rally attendees. She scanned and sent them on to the Wash. DC office. Although the chances of changing Senator Cornyn’s mind are slim we have to keep trying, and we want him to know that there are many supporters here in the RGV! 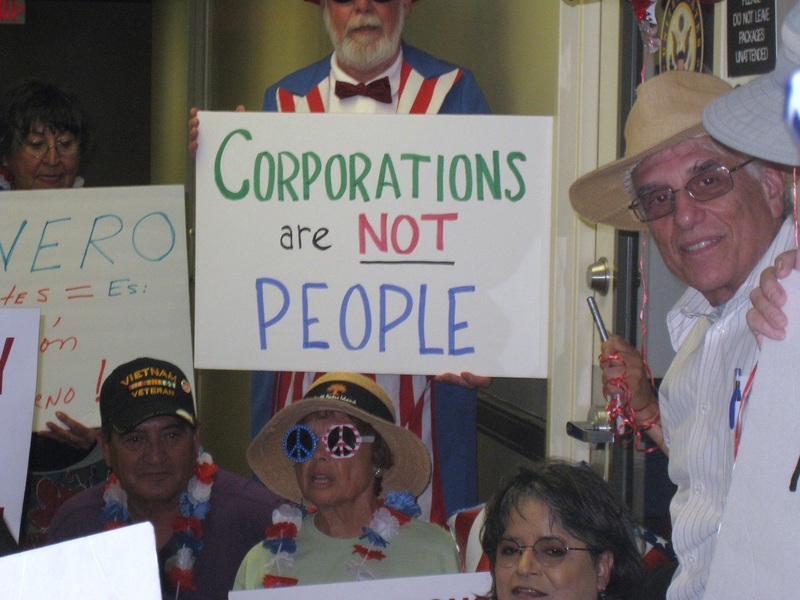 The Rally was in conjunction with a nation-wide campaign organized by our partner, Public Citizen, where groups across the country met with Senators asking them to support SJ Res 19. Senate Judiciary Committee will vote on the proposed amendment on July 10. After that, it will go to the full Senate, either later in July, or after the August congressional recess. Both Texas Senators are on the Judiciary Committee and could be influential in getting this amendment. We just need to persuade them! This proposed amendment would reverse the devastating Citizens United and McCutcheon decisions by The Supreme Court and would allow Congress to regulate campaign contributions. Powerful opposition to the amendment is already geared up to undermine efforts which challenge their control of our democracy. We do not have the power of money to fight them, but we have The Power of the People. Call both Texas Senators and the other Judiciary Committee Members in time for the July 10 vote.